Week 3 of the Turf project is in the books and we're one step closer to the finish line. Below you'll see some pictures of the progress and below that, an update from the contractor and also an update from the turf committee as to where things stand financially. The phase of the project this week was laying down and compacting a stone base over the compacted dirt base. In the pictures you'll notice a black fabric between the dirt and the stone, that's actually a porous fabric to aid in water drainage. As of Saturday morning, stone covered about 75% of the field with the remainder to be done next week. The field should be covered in stone and compacted by next Thursday the 5th. Lastly, here are two panoramas...one from Thursday June 28th and the other from Saturday June 30th. 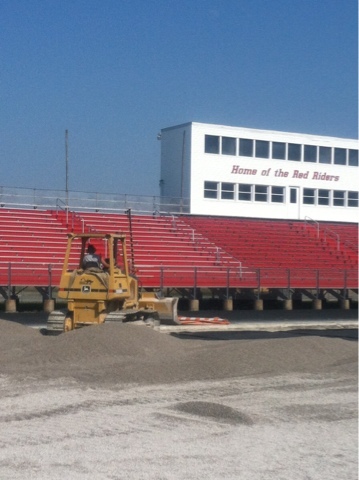 Once the stone is in place, the work will then shift to the track. 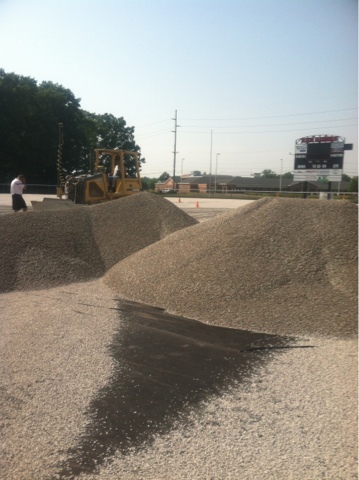 VASCO Asphalt from Massillon will begin tearing out the old track and pouring the new track as well as pouring the long jump and pole vault runways. This part of the project should begin by this coming Thursday July 5th. This will take until mid-July and at that time (weather permitting), it is expected that the turf crew will arrive and begin installation of the turf. And I have to apologize for having a date wrong, the first home game with Triway is August 31st, not September 7th as I stated earlier. Current fundraising totals are just shy of $520,000....with the goal of the project still set at $750,000. 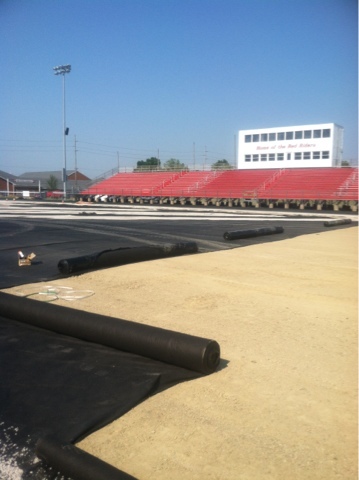 Money needed to fully pay for the turf project and associated costs is going to be near $600,000. Any money raised in excess of $600,000 will be split between turf maintenance/replacement costs and a project to replace the fencing around the stadium...which if you've seen lately, you can appreciate the effort to replace it. The turf committee has also released a list of business and individual donors that have already contributed to this project. Click here to view the list. This list will also be published at the Team Up For Turf Website in the coming days as well. I know there are a lot of local businesses that have committed to pledge, and once the pledge is received, their name will be added to the list. Pretty amazing that $500,000+ has been raised by about 100 donors. When I look at this and think that there are hundreds (if not thousands) of Orrville alumni out there, I can't help but be 100% confident that we're going to meet our goal. Not to beat a dead horse, but giving to this project couldn't be easier. You don't even have to leave your house to do it. Just head over to www.RedRiderTurf.com and click the 'Donate' button or print out a pledge card and mail in your contribution. We appreciate the 100 "kickstarters" that have already given generously and encourage you to be part of the next 100 to get this project across the finish line. Again, just to drive home this point....no donation is too small. $100 is $100 we didn't have before you gave generously. Are you one of the next 100 donors?